【7 Changing LED Lights】- Spark Your Kid's Imagination with 7 Changing Mood Lights, each of which is adjustable between Bright and Dim modes, and could be set steady on. Great night light for young children scared of the dark at bedtime. Color including: Green, Dark blue, Red, Yellow, Pink, Light blue, White. 【Safety Protection】- Essential Oil Diffuser will power off if there should be no water in it. The top of this device twists off for easy fill. Power cord plug from the bottom with a place for the cord to carry out from the side of the diffuser offering stability.. Portable for Home, Yoga, Office, Spa, Bedroom, Baby Room. Perfect gift idea for family and friends who love aromatherapy or can benefit from Aromatherapy healing. 【Benefits for Your Health】- Add a few drops of your favorite essential oil (NOT INCLUDED) to enjoy wonderful aromas throughout your home. Humidify the air, breathe easier, and relieve cough and sinus congestion due to colds, allergies, and flu. Reduce odors in your house from cigarettes, cooking, and pets. 【Multifunctional Usage】- Fill the space it was with a lovely fragrance that can lift your mood and relieve stress from stressful and tired day, perfect for masking stubborn smoking and pet odors, get great and peaceful nights' sleep surrounded by the aromatic fragrance. 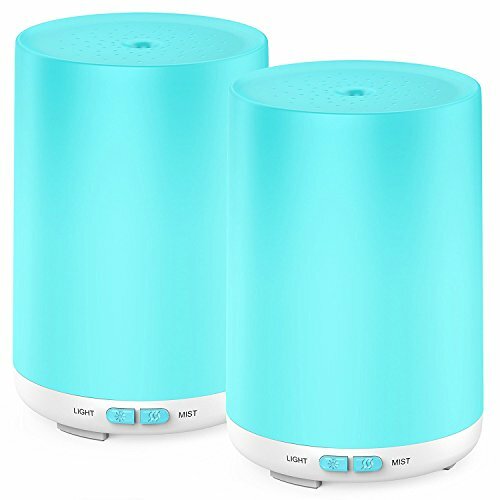 Whisper-Quiet Ultrasonic Operation - humidify your living space to prevent dry, stuffy air and flu/cold germs infecting your loved ones. Prevent dry and chapped skin in dry winter months. If you have any questions about this product by Leknes, contact us by completing and submitting the form below. If you are looking for a specif part number, please include it with your message.